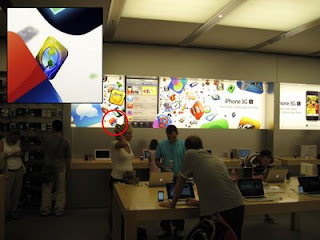 For starters, the FTP on the Go icon is on the wall at the Apple Store in Caesars Palace! I'm guessing it is also on the walls of most other Apple Stores in the country. It is also shown on the video introducing the new iPhone 3GS. NICE! Next, Vanessa Rousso Played "Heads Up: Hold'em" and liked it! Here she is (it's a cell phone picture, sorry) next to the real-life "Luckbox Larry." 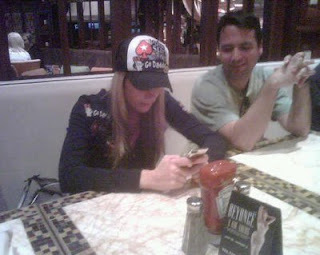 We all had lunch together before she went to play day 2 of the $10k pot-limit Hold'em event at the WSOP. She placed 15th and won $43,000 in that event. Lastly, although I was unsuccessful in any tournaments (Wynn twice, Caesars once, Planet Hollywood once) I scored a nice big $755 win playing $2-5nl cash games at the Rio. ($200 buy in, $955 cash out.) The big win came on my first day in town and really helped cover me for all the tournament losses.